Life of Brett: Manny Being Manny ... or Manipulated? Manny Ramírez was one of the main reasons the Boston Red Sox won the World Series in 2003, ending The Curse, and more importantly, my ability to use it to get the upper hand in a Yankee-Red Sox argument with my godfather. Manny was also one of the main reasons the Chicago Cubs Curse will last more than 100 years. The previous statements are true because Manny is one of the greatest hitters of my lifetime. For all his consistently brilliant hitting during his Hall of Fame career, Manny is often scrutinized by the media. Many reporters say Manny doesn’t respect the game. Tim McCarver went as far to say his behavior in Boston this summer was “despicable.” Others simply enjoy telling each other “Manny Being Manny” stories. Obsessed Red Sox fan Bill Simmons wrote a 9,000-word story on Manny Ramírez, "Manny Being Manipulated," for ESPN Outside the Lines. Manny nearly changed his mind at the last minute when he realized he couldn’t bring Frankie Mancini along with him. Who’s Frankie Mancini? The Cleveland clubhouse attendant who set up the pitching machine for him every afternoon. Think about that for a second. It’s patently insane…. Manny’s behavior was even unusual for him this summer in Boston. Though he had given the Red Sox two World Series titles, he still got a general bad wrap from the Boston media. Maybe Manny felt that no matter how many homeruns he hit or how many games the team won, fans didn’t truly appreciate him. When the team lost and he was in a slump, they turned on him. It’s not the first time this has happened in Boston. Don’t forget, the greatest hitter to put on a Red Sox uniform refused ever to tip his cap after hitting a homerun, including his famous homerun in his last career at-bat. Ted Williams never tipped his cap, not even once, just to get back at the occasional boos he felt were unmerited from Boston fans. But let’s cut to the chase. The lifestyle and money were two good reasons for Manny to jump ship. Manny never totally fit in Boston. People were too white and uptight for him. Los Angeles is a much better fit. 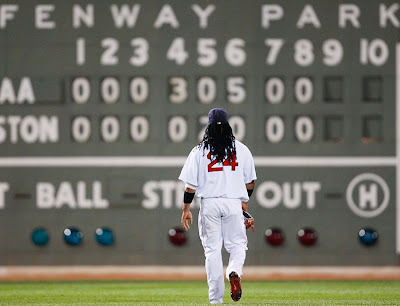 (Manny recently told the L.A. Times, "Baseball in Boston is like a Sunday football game, but played every day. We lose in L.A., I go to breakfast and people say, 'Well, you'll get them tomorrow.' In Boston, it's 'Hey, what's going on, the Yankees are coming.' It's just a different atmosphere. The fans in Boston got your back no matter what, but I'm talking about the people who write all this bull because it means so much to them. If your happiness depends on Boston winning or losing, you have to get a life.") 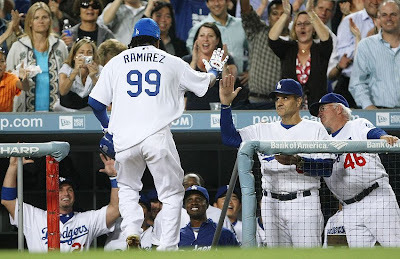 Maybe this is why he belted two homeruns and batted .500 in the first-round series to help the Dodgers sweep the Cubs. Then again, it always comes down to the money no matter how much you try to look at it from a baseball purest point of view. Simmons blames it all on Manny’s agent Scott Boras, saying that Boras is “one of the worst human beings in America who hasn’t actually committed a crime.” Even with this strong of a comment, Manny’s motives still remain a mystery.